Fearing a mass exodus of physicians from the lucrative ACGME-mandated Maintenance of Certification (MOC) program, two member organizations of the ACGME, the American Board of Medical Specialties (ABMS) and the American Osteopathic Association (AOA), recently issued statements of "disappointment" or "promising to innovate." The ABMS stated they were "disappointed" on the passage of the Oklahoma law outlawing the use of the ABMS MOC program for board certification, physician hospital credentialing, or insurance company payments and were "committed to improving their programs for physician certification and assuring that participation in MOC provides physicians with meaningful improvement opportunities." No mention of how they might cut the cost of their "commitment" to physicians was made. The AOA's statement, issued just after the National Board of Physicians and surgeons open its credentialing process to osteopaths, "promised to innovate" so they could reach their "Rooftop Goals." Too bad the AOA still doesn't seem to understand that their statement promotes just what physicians don't need: another bureaucratic building project. Neither statement issued by the ACGME member organizations provide convincing arguments of sincerity to practicing physicians that have seen their hard-earned cash squandered by these organizations and have failed to truly prove the clinical relevance or need for re-certification of any kind. Further, no accountability for the financial mismanagement, strongman tactics used by ABMS member boards to assure physician payments into this unproven metric, and fraudulent tax filings by member boards of the ABMS has yet to take place. This outdated ACGME physician MOC re-credentialing system built on political and corporate cronyism is being rendered obsolete by the presence of real competition to the status quo by the National Board of Physicians and Surgeons' credentialing process that is credible, more affordable, and financially transparent. There is simply no going back. Good riddance MOC. Trust me: you won't be missed. Nor will those who've made a living for themselves promoting this very broken and highly conflicted ABMS MOC program. I find it interesting that my comment to the New England of Journal of Medicine pointing out the undisclosed conflict of interest highlighted above and mentioned two days ago on this blog has yet to be published in the comments section appended to the article. Authors must disclose their financial conflicts. 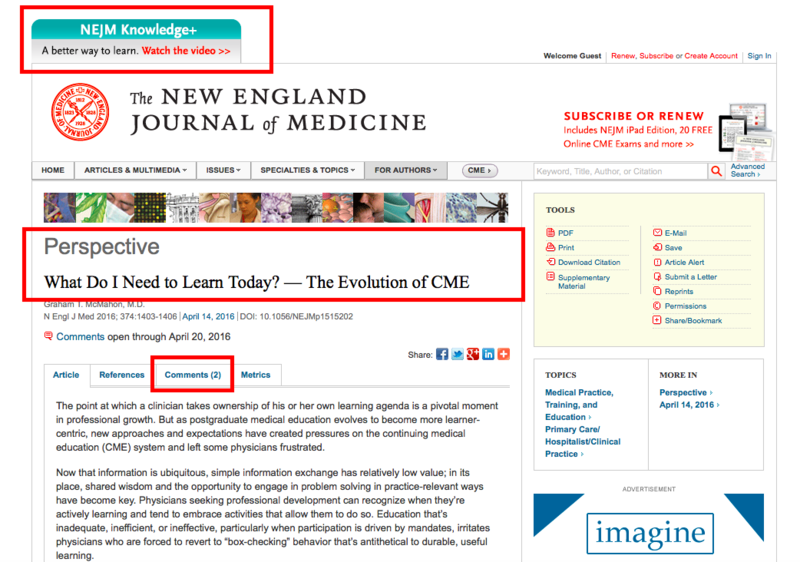 Why don't the editors of the New England Journal of Medicine? It appears the cronyism displayed by the ACGME in support of the American Board of Medical Specialties Maintenance of Certification (MOC) product also extends to our "finest" medical publications. Addendum 07:50AM CST: 9 Comments (including mine) now appear on the NEJM website. Medicine has an image problem. On one hand, medicine is full of wonder: incredible technology, incredible innovation, and incredibly bright people. On the other, medicine is full of avarice, full of greed, and full of waste, much of it by the very same folks who bring us all that medicine has to offer: the Accreditation Council for Graduate Medical Education (ACGME). The ACGME is an incredibly rich and powerful organization in medicine. It is comprised of the American Medical Association, (AMA), the American Board of Medical Specialties (ABMS) and its 24 member boards (including my "favorite", the American Board of Internal Medicine (ABIM)), the American Hospital Association (AHA), the Association of American Medical Colleges (AAMC), the Council of Medical Specialty Societies (CMSS), the American Osteopathic Association (AOA), and the American Association of Colleges of Osteopathic Medicine (AACOM). Collectively, member organizations of the ACGME represent an annual burn rate of almost $1 billion dollars for medicine (Latest annual income figures from Guidestar.org: AMA ($261,328,052), AHA ($126,339,392), ABMS and its 24 member boards (Approximately $300,000,000; $54,454,584 for the ABIM alone), CMSS ($967,541), AOA ($44,376,054), AACOM ($10,855,122)). As part of the ACGME's "Vision" statement, they "imagine a world" where residents and fellows are "prepared to become Virtuous Physicians who will place the needs and well-being of patients first." This is where the ACGME's "vision" clashes with reality. Right now, the average "Virtuous Physician" has a median debt load of $180,000 before they graduate from medical school and patients are experiencing bankruptcies from health care as our Medical Education Establishment dines at the Four Seasons and takes a few more reps in the gym. The ACGME and their kin are still living in the world where first class air travel, memberships at health clubs, and $2.3 million condominiums with chauffeur-driven Mercedes S-class town cars are the norm. The ACGME seems blind to the irony of serving Virtuous Physicians while having one of its core values the "Engagement of Stakeholders" like their "friends in accreditation" at the Accreditation Council for Continuing Medicine Education, the Joint Commission on Accreditation of Hospital Organizations, the National Board of Medical Examiners, and the Federation of State Medical Boards, who foist educational programs like their unproven and wasteful Maintenance of Certification (MOC) program to fund their largess. So it should come as no surprise that even our most "prestigious" academic journals like the New England Journal of Medicine (NEJM) are joining in on the fun. This week they permitted a promotional "perspective" piece entitled "What Do I Need to Learn Today - the Evolution of CME" to be published by the head of the Accreditation Council for Continuing Medical Education (ACCME), Graham T. McMahon, MD. Like other accreditation organizations within the ACGME, Dr. McMahon enjoys paid first class airfare and health club membership while promoting the legitimacy and expense of the costly and unproven ABMS MOC program that finds itself in a whirl of ethical controversy already. Meanwhile, the NEJM is selling its expanded and remarkably expensive "Knowledge +" MOC educational product without ever acknowledging this conflict to its readers in this week's issue. Our tired and inefficient "non-profit" bureaucratic medical education system better wake up soon to the new reality in medicine: practicing physicians and their patients are feeling the adverse effects of all those health clubs and first-class airfares. In this time of serious cuts to patient care budgets in medicine, it's time our Medical Education and Publishing Establishment starts "learning what it needs to do today" besides stumping for wasteful "CME" programs and harvesting its budget from those who are finding it harder and harder to believe that our expensive medical education bureaucracy has their best interests in mind. As it continues to spiral out of control, the American Board of Internal Medicine (ABIM) issued a press release telling practicing physicians what they've "learned" from "key findings from a representative sample" of internists. Sadly, how their "representative sample" of internists' survey responses was collected and reported for this press release is telling. Reviewing the methods used for the survey collection, we see ABIM's "ALL DIPLOMATE" survey was really created from less than 0.2% of all internists they polled. (360 respondents of 196,867 emails sent) and the results were "weighted" from a select subset of the internists whom they repeatedly queried to assure an acceptable response rate, introducing substantial selection bias). What the ABIM continues to ignore is the overwhelming rebuke of the MOC process from over 23,000 physicians in 2014 and a similar survey result from the membership of the American College of Cardiology. Propaganda masquerading as flawed survey results that are obtained by unaccountable organizations with large conflicts of interest with the physician testing/quality industry has no place in the practice of medicine. Press releases such as this one issued by the ABIM are both irresponsible and misleading. By issuing this press release, the ABIM demonstrates its blatant disregard for the best interests of physicians and patient care just so they can maintain their lucrative MOC program. In an unusual show of solidarity, twelve membership societies sent a carefully worded letter to Richard Baron, MD, President and CEO of the American Board of Internal Medicine (ABIM), asking him, basically, WTF? For the past year, ABIM has actively solicited feedback from and encouraged the internal medicine community to engage in co-creating an MOC (Maintenance of Certification) program for the future. Despite these interactions—and even though our societies dedicate considerable resources to helping our members complete the MOC process—we are struggling to understand ABIM’s plan for re-engineering MOC to reflect the changing nature of medical practice. However well intentioned, the overall vision, philosophy or strategy of ABIM’s changes to MOC are not clearly stated. Further, the lack of a shared vision makes it more difficult and costly for societies to adjust to changes made by ABIM that are implemented with little input from or notice to the societies. While this letter might be "well-intentioned," it still buys into the notion that all MOC needs is to be properly “fixed.” These leaders completely ignore all of the financial improprieties that are part and parcel of the ABIM and MOC. They should be calling for its demise, or ensuring that MOC remains forever truly voluntary,by decrying any future linkage to licensure, reimbursement from payors, or hospital privileges, or they should join the mass noncompliance bandwagon. Let's hope, however, that this letter represents the first crack in the ABIM's MOC "foundation." It is time membership societies stop beating around the bush and acknowledge how deeply corrupt and flawed the MOC program has become and understand that their membership is ready to jump ship if they don't. They have a choice to make: ally with their practicing physician membership or ally with ABIM. Which will it be? I would suggest they start working on their next letter explaining to the ABIM what is actually happening. It was Friday, the weekend not far away. It always seems that hospital people step lightly on Fridays, hurrying to get work done in anticipation of a few days off, the kids' soccer game, a concert, a dinner out. Upbeat, if you will. So when the elevator door opened and he walked in, it was very different. I recognized him immediately for I had cared for him years before. Gentle, kind man, usually with a smile, a polite nod. He was always with his wife. His a heart rhythm problem as I recalled. Now he and I alone. I struggled to remember his name. His look was very different that I had remembered. This time, the smile was very brief, tired. His face and frame much thinner. He looked away, fumbling for the elevator button, found it, and leaned back against the wall. There, peeking out from beneath the right-hand side of his shirt were the edges of a bag and tubing. The diagnosis and prognosis now plainly coming into view. It was hard to speak, not knowing what to say, so we just waited together, feeling the elevator travel its one short floor. Suddenly, the door opened again, our time together too brief, our earlier time so trivial in comparison. His journey much different now. I was lost for words but said goodbye. I could tell his mind was elsewhere. Anywhere but Friday. It was so brief, telling, humbling, and real.